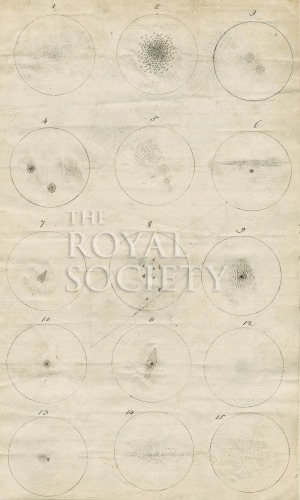 Plate 17 figures 1-15 for the paper “Account of some observations tending to investigate the construction of the heavens”, by William Herschel, Philosophical Transactions of the Royal Society, vol.74 part 2 (1784), pp.437-451. Figure 1 shows Messier’s object M.98, a spiral galaxy in Coma Berenices; figure 2 is M.53, a globular cluster also in Coma Berenices; the remainder not identified by Herschel. This original figure in portrait format with the 15 figures arranged as 3x5 images was re-worked for publication into landscape format with the figures arranged 5x3 by the engraver.